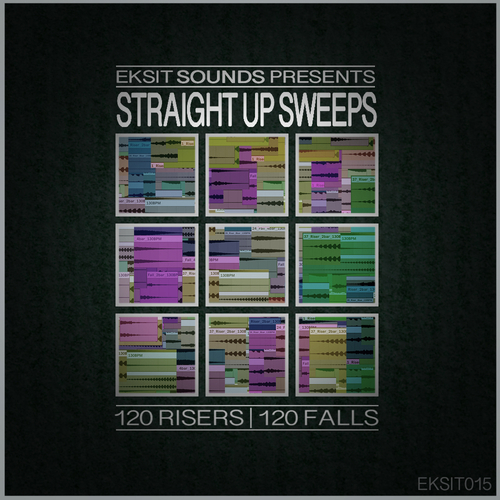 Eksit Sounds is back again to present you with a fantastic collection of sweep FX to fill your tracks transitional needs. The Straight Up Sweeps pack purely focuses on sweeps. The ups and the downs. Nothing more, nothing less. Spread between 2, 4 and 8 bar lengths, these samples will allow you to really add more climax to those builds in your tracks. Use them individually or layer them together you are getting a big selection of FX to choose from. The Straight Up Sweeps pack is getting you 80 risers and 80 falls and if you need instant side chaining action there are are also 40 ups and 40 downs as well. Totaling 240 sweeps that you swap, layer, combine and use individually. In a way this pack is very simple but what it does, it does very well. The preview presents these sweeps in the house genre but really you can add these to any electronic music track you are making. DISCLAIMER: The preview contains bass, pad and drum sounds that are not contained in the pack. All of the sweeps are contained in the pack.